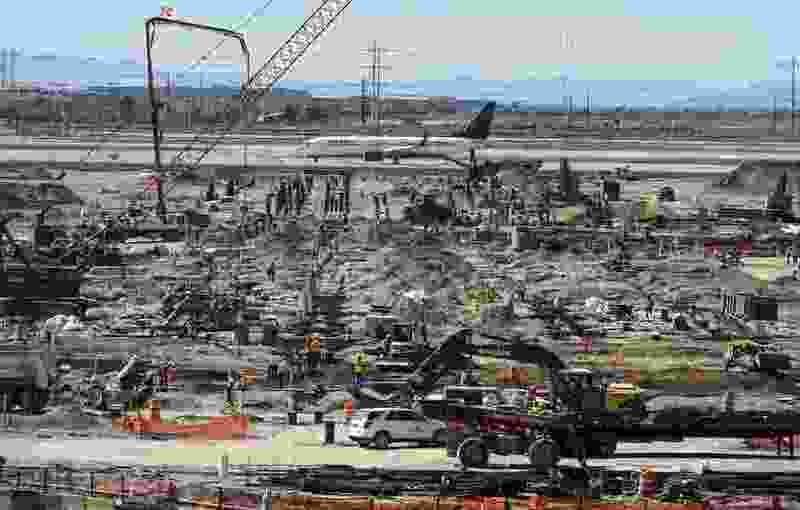 Steve Griffin | The Salt Lake Tribune Construction on the new terminal at the Salt Lake City International Airport in Salt Lake City Wednesday March 15, 2017. Salt Lake City International Airport set another record for passengers last year, logging more than 24 million passengers for the first time. The airport reported Monday that the total number of passengers that passed through it in 2017 was 24,196,816, up by 4.5 percent. The vast majority of those were domestic passengers: 23.29 million, up 4 percent. There were also 913,628 international passengers, representing an increase of more than 20 percent. The airport currently is undergoing a $3.6 billion redevelopment program, funded by user fees from airlines. Its first phase is scheduled to be completed in 2020. Terminal 1 at the airport was built in the early 1960s, while Terminal 2 was built in the late 1970s and early 1980s. They were designed to accommodate 10 million domestic passengers. The airport reports that it is now the 25th busiest airport in North America, and 85th busiest in the world. It has more than 330 flights daily to 95 nonstop destinations.